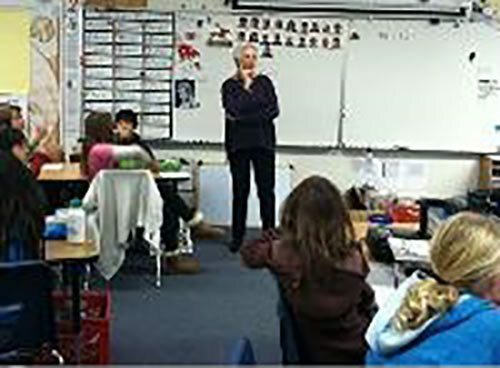 I taught this mental math lesson to a class of fourth graders. I chose an addition problem—99 + 17—for the students to solve mentally, purposely selecting a problem that would be accessible to the students. Also, I knew that the problem could be solved in different ways. I planned to elicit from the students strategies for figuring out the sum of 116 and then to show video clips of other students solving the same problem. After watching each video clip, we’d analyze how the student reasoned and then check back to see if anyone in our class used the same strategy. I present this lesson in a video that’s similar to the one I made for my previous post. It’s basically a Power Point presentation that I’ve narrated to describe how the lesson actually unfolded with fourth graders. The presentation runs just about 8 minutes. I’m interested in your feedback about if the video is useful. Also, if you watched the presentation from my previous post where I reproduced how I recorded on the board instead of taking photos of what I did, I’m interested if one format is more useful or appealing than the other. Here’s how the lesson went. These are from the Math Reasoning Inventory (MRI), a free online assessment tool. For additional information about the tool and how to access these and other videos, see my earlier blog post We Ask, We Listen, We Learn. When I repeated the lesson with 15 x 12, I changed the sequence and showed the video clips first. It didn’t work! The students need to buy in first. I led a similar lesson for the problem 15 x 12. Again, I selected three videos or interviews from the MRI site to show the class how Monica, Malcolm, and Alberto figured out mentally that the answer was 180. I chose these particular clips (available on the MRI Video Library) because, as for 99 + 17, the students all figured out the correct answer. Also, while they all applied the distributive property, they each took a different numerical approach to the problem. The lesson didn’t work this time! That’s because I changed the sequence from what I had done with 99 + 17. For 15 x 12, I showed the video clips to the students in the class first, before asking them to engage with the problem, figure out the answer for themselves, and report their strategies. I didn’t initially record solution strategies on the board as I had done for 99 + 17. Showing the clips for 15 x 12 to the students before they had a chance to think about the problem for themselves was not a good instructional decision. Without the initial investment of their own thinking, the students weren’t able to or interested in engaging with the problem on the video clips. They didn’t have a context for listening to the students interviewed in the video clips. On reflection, this was a “what-was-I-thinking” experience, a pedagogical error that I won’t repeat. It’s important for students to buy in first. I’ve shared this Power Point presentation in sessions with teachers. Below are a few of the questions they asked and the responses I gave. If you have any other questions, post them and I’ll respond. Q. What if only one or two students have an idea for how to compute 99 + 17? A. In this situation, I typically do one of two things. Sometimes I offer a strategy and record it as I explain (labeling it Ms. Burns as I label theirs with their names). Another is to acknowledge that the ideas on the board were the only ones they had so far, and ask them to turn and talk with a partner to see if they can come up with another strategy. Q. Why do you write students’ names on the board when they report? A. Two reasons. One is it makes it easier to refer back to particular strategies. Another is that it honors the student who reported, which I think is important. Q. I noticed that in some of the video clips of interviews on the MRI site, students answer incorrectly. Do you show these video clips as well and ask students to figure out the error? A. While I think the video clips of students making errors can help us as teachers, I do not choose to show them to students. I prefer to select examples from which students can learn appropriate strategies. Q. What do you mean by “strategies appropriate to the numbers at hand”? A. One of the MRI video clips for 99 + 17 that I chose not to show to the fourth graders shows Zakari solving the problem by counting up by ones from 99. While counting on is an acceptable strategy for younger students, I don’t think it’s acceptable for fifth graders. Watch Mallika Scott interviewing Zakari. Similarly, a video clip of Ana shows her using her finger on the desktop as if she were solving the problem with paper and pencil. Watch Leo Kostelnik interviewing Ana. While neither of these video clips by themselves indicate that Zakari or Ana necessarily lacks number sense, it’s important to check that students are able to reason numerically by applying place value and properties of numbers. When answering other questions, Zakari demonstrated that he had other strategies to rely on. Ana, however, didn’t and always resorted to algorithms, even for the problem 1000 – 998. She wore her finger smooth on the desktop. You can watch other interviews with Zakari and Ana at the MRI Video Library.